It’s the annual BEACON center gathering this weekend, when us evolution-in-action eggheads gather and think deep thoughts. One session I attended today focused on major transitions in evolution that change the level on which natural selection acts. For instance, natural selection can act on the level of a single cell, a collection of cells acting as an organism, or on a society of related organisms. There’s of course a lot of argument over when and how multi-level selection works (or whether it’s ever important), but that wasn’t the point: we were interested in the evolutionary events that produce the levels. One of the conveners of the session was Will Ratcliff, who as a postdoc in Mike Travisano’s lab at the University of Minnesota did some very inventive work where he coerced a single-celled yeast to form a multicellular morphology. What Ratcliff did was to briefly centrifuge populations of yeast unicells growing in test tubes and then use the very bottom of the culture to seed a new population. In this way, only the heaviest cells — the ones that were pushed to the bottom of the test tube by the centrifuge the fastest — survived to the next generation. By repeating this artificial selection for many generations, Ratcliff evolved yeast that stayed stuck together after cell division. Since mothers stayed glued to their daughters, these yeast formed large “snowflake” clusters composed of many cells. In their 2012 PNAS paper, Ratcliff and co-workers argued that the snowflake yeast had undergone a major transition. Whereas the ancestral yeast lived, fought, and reproduced or died as single cells, the evolved snowflakes were selected together, much like any other multicellular organism (like you and me, for instance). 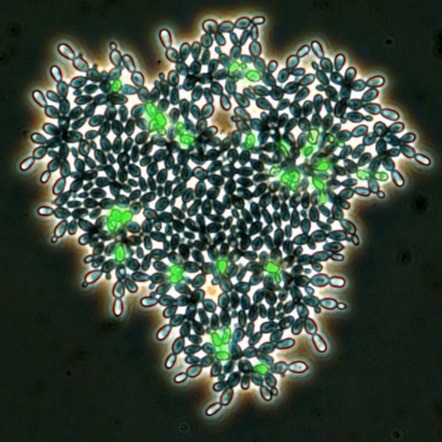 Some of Ratcliff et al.’s arguments about programmed cell death strike me as highly speculative and poorly supported, but nevertheless they made a good case that the snowflake morphotype was a multicellular organism. Ratcliff has gone on to use this experiment as the basis of a very cool teaching exercise for undergraduates. The really neat thing about the paper, and why it garnered so much attention, was just how easy it was to turn a “simple” unicell into a “more complex” multicellular critter. All the blathering flat-earth Creationists want to believe that every big step along the line from bacteria to humans represents some insurmountable problem that selection can’t be expected to cross. We argue that none of those big steps are really all that complicated or difficult to take, and Ratcliff showed that this was definitely the case for the transition to multicellularity. But as I listened to Will talk about this work today I started to wonder: was the transition to multicellularity really an important transition in the ancient history of life? We sort of assume it was, and we assume that the single celled bacterium is the simplest possible kind of life. Maybe that’s so, but does it follow that, because the single-cell is simplest, that it’s also the most ancient? Is it possible that the Last Universal Common Ancestor — let’s call it Luca — of all extant organisms was a multicellular organism? Let’s think this through. Life probably originated on (or in) a surface. Not only are there more options for chemical reactions and catalysis on surfaces, but absent swimming or buoyancy or whatever, the first living systems would have eventually sunk until they landed on something solid. Given that, as these systems grew, they’d usually stay in more or less the same place. If they moved, it would be because physical forces sheared them away from their surface and carried them off in chunks to some other place. The great microbiologist Carl Woese put a lot of thought into what Luca would have been like. He envisioned something he called a “progenote” — a pre-cellular bag of chemical reactions with no clearly defined genome. Imagine genes floating about in a membrane-bound soup as independently replicating units, much like modern plasmids. Such a thing wouldn’t reproduce in any way we’re used to thinking about. “Cell division” would probably occur in a manner analogous to how oil bubbles fragment when you shake an emulsion. And when bubbles blebbed off, they’d probably take a partially random assortment of genes with them. At some point, biochemical pathways would have arisen that had incompatible intermediates, and active partitioning of components — the formation of something akin to a modern cell — would have been selectively advantageous. But even then, the boundaries between “individuals” would have been extremely porous even by bacterial standards and genes and their products would be rapidly shared throughout the local community. Thus, these non-motile organisms would still have existed in highly interdependent populations in close association with each other. First, you have to package enough genes into one soap bubble to reliably produce all your basic molecules by yourself. In the Archaean world, before the accumulation of complex organic matter in the biosphere, that meant prototrophy — the ability to make all the amino acids, all the membrane lipids, all the nucleotides needed for life. Next, you need to firmly separate yourself from your parent. In Ratcliff’s snowflake yeast, it turns out that the unicellular form requires active expression of a protein that breaks daughter cells off from their parents, and when that protein is deactivated, the cells remain stuck together and form snowflakes. In other words, the default is to stay stuck together and it requires energy input and a novel enzyme to break apart. Last, you need some way to operate as a single cell. Even if you’ve declared yourself independent of your parents, if you can’t walk out the door and drive away it’s all vainglory. For an American teenager, getting away from Mom and Dad probably requires a car. For a bacterium, it probably means motility. Motility! One of the most spectacularly complicated and energy-demanding activities of the microbial world. If the default is to stick together, and it takes proteins and fancy whiz-bang flagella to live as a single cell, then it stands to reason that unicellularity is a derived trait, and the big transition was from multicell communities to planktonic single cells, not the other way around! Why might a cell want to leave the collective and strike out on its own? Mooching, and the possibility of the tragedy of the commons, is always a problem when cells try to socialize with each other. Also, swimming away from the blob might result in better access to nutrients, or freedom from toxic waste products. More darkly, maybe what you really want is to eat your neighbors, and having devoured Mom and Dad, you need to swim off in search of fresh blobs to conquer. Much of what I’ve written here could also apply to how we think about human society. There’s always this strange desire to think of humans as atomized individuals that need to be whipped up into societies by governments, cops, gods, or whatever. But I think we can safely say, based on observations of all the other primates, that our ancestors were strongly social, and that the collective is the natural state of human beings. The derived state is that of individuality, and maintaining the conditions that allow individual liberty requires a lot of energy and cultural adaptation. In other words, you don’t have to do anything at all to get people to form societies, but it takes constant vigilance to protect ourselves from those societies.